Discover and experience the Heart of the 1000 Islands, majestic castles and whispers of a thousand legends, as you cruise the breathtaking 1000 Islands with 1000 Islands Cruises Rockport. This wonderfully lush landscape is dotted with luxurious cottages and vast estates. None of the tour boat companies can show you all 1,864 islands on a single tour. 1000 Islands Cruises Rockport has an advantage being in the Heart of the 1000 Islands and you will be able to see all of the highlights on any of our cruises. 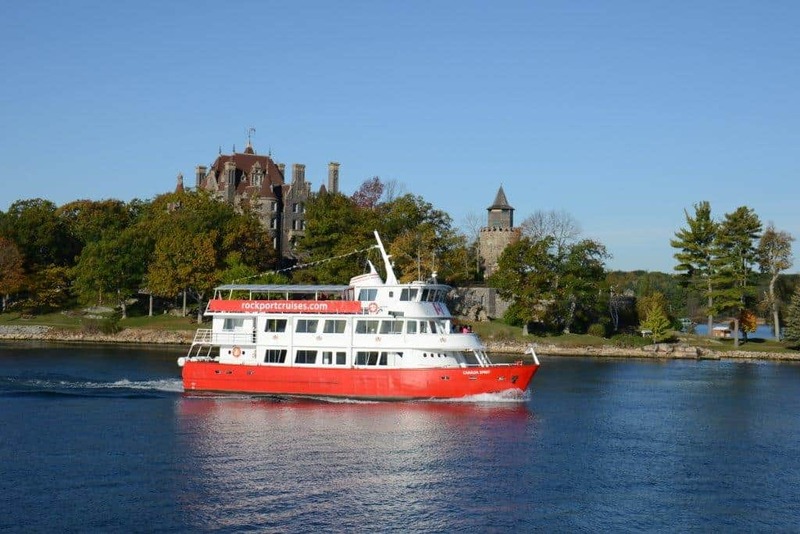 We are the only boat line that will show you the famous Boldt Castle on all of our tours. Come and experience our own brand of “Canadian” hospitality in the historic and quaint village of Rockport, Ontario. Explore the rugged natural beauty of the St. Lawrence river as you set off from the beautiful village of Rockport, Ontario, Canada. Imagine an era of elegance and nobility, majestic castles and whispers of a thousand legends. Cruise in the “heart” of the exhilarating 1000 Islands on one of the areas finest tours. Scenic tours of the 1000 Islands have been operating since the late 1800’s when Steam boats plied the waters from the docks in Rockport. The first Ferryboat from Alexandria Bay to Rockport started operation in the year of 1924. Once the Thousand Islands Bridge was erected the ferry boats were discontinued but the sightseeing boats continued. Rockport Boat Line was originally founded in 1954. Today Rockport Cruises is a world class leader in tourism with thousands of tourists from all over the world visiting the picturesque historic village of Rockport Ontario each season. We play a key role in attracting international visitors to the 1000 Islands region. All our tour boats and facilities meet the most stringent and current Transport Canada Marine Safety and Security Regulations. Accessible washroom facilities are available in our arrival area and in our restaurant. Washrooms on our boats have limited accessibility. Licensed bar and snacks are available for purchase onboard our boats. Commentary onboard is available in 13 languages. Our grounds and gardens are beautifully landscaped and offer picnic tables and benches for relaxing. Snacks, ice cream and cold drinks are available from our concession stands. Our Island View Waterfront Restaurant is open for breakfast and we offer a daily lunch buffet for our group tours. For a relaxing lunch or dinner we recommend our Boathouse Restaurant and Patio or Cornwall’s Pub. An ATM machine is available on site for our visitors. The Rockport General Store and Gift Shop have a nostalgic theme befitting Rockport’s rich history. Today, the store carries unique gift items, handcrafts featuring local artisans, jewelry, clothing and specialty food items including the world famous 1000 Islands dressing. You will be sure to find something to commemorate your visit to the 1000 Islands.